Manchester United forward Anthony Martial. OLE GUNNAR SOLSKJAER hopes Anthony Martial will agree a new contract with Manchester United in the coming weeks as the club look to tie down a clutch of top players. France forward Martial and goalkeeper David de Gea are both out of contract at the end of next season after United triggered 12-month extension options shortly before Christmas. The club are in talks with both players as well as forward Juan Mata, whose contract expires this coming June. Ed Woodward, United’s executive vice-chairman, is known to be keen to get the futures of all three players sorted out while he works on appointing a permanent manager before the start of next season. 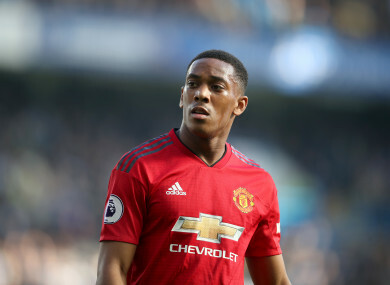 Martial is understood to be close to agreeing a five-year contract, while Spain international De Gea has made it clear he wants to remain at Old Trafford. Solskjaer, United’s caretaker manager for the rest of this season following the sacking of Jose Mourinho in December, has received indications that strong progress has been made with Martial, De Gea and Mata. Solskjaer, who has won his first seven matches in charge, will attempt to extend that run on Friday, when his side visit Arsenal in the fourth round of the FA Cup. Reports in the British media have suggested that United have rejected an approach from Arsenal to take Eric Bailly on loan for the rest of the season but Solskjaer said he was not aware of any approach for the Ivory Coast defender. Solskjaer is looking forward to facing Arsenal, a team with whom United enjoyed a fierce rivalry during his time as a player at Old Trafford, between 1996 and 2007. The 1999 semi-final has become part of United folklore, with Ryan Giggs scoring a memorable individual goal to win a replay at Villa Park as the club went on to win the treble of Champions League, Premier League and FA Cup. Solskjaer said: “It was fantastic. That’s the one fierce football rivalry of my years here as a player. “We were always the closest rivals. They won the double, we won the treble. The games were just fantastic. Solskjaer described the disappearance of Cardiff striker Emiliano Sala as “tragic news”. The Argentine forward, signed from Nantes, was on board a plane from France to south Wales that disappeared from radar on Monday just north of Alderney, in the Channel Islands. Solskjaer, who managed Cardiff between January and September 2014, said: “It’s tragic news. When you wake up, you hope to read good news but the more time it goes the less likely it is. Email “'The club's making progress': Solskjaer hopeful over new Martial contract”. Feedback on “'The club's making progress': Solskjaer hopeful over new Martial contract”.